Even brewers known for their quirky beers every year grow nostalgic for pumpkin ale. That’s the case with Dogfish Head Brewing Founder and CEO Sam Calagione. He holds the brewery’s Punkin Ale in a special place not because its Dogfish’s top selling seasonal brew, but because it is the original Dogfish brew. Calagione made it a year before he opened the Delaware brewery in 1995. Calagione entered the beer at a recipe contest at the rowdy Delaware Punkin Chunkin festival (known for its pumpkin tossing competition). He won. “Organic brown sugar, crushed pumpkin, crushed spices like cinnamon and allspice give our pumpkin ale a super duper pumpkiny character without being too over the top,” he said. The 7% abv. Punkin has a strong bold taste and has been a stable offering for Dogfish every fall. Of course, many pumpkin ales appear well before the first leaves start turning colors. Dogfish released its Punkin ale in early August, though its typically sold through November. With so many flavored beers and styles today, its fair to ask whether pumpkin beers are losing their allure. It’s a question some are asking after several breweries reported declining sales of it last year and pumpkin ales were still on some store shelves in middle of winter. In addition, some breweries have replaced pumpkin ale with other fall-like ingredients such as maple, sweet potato and yam. No one is better to answer that than Julia Herz, craft beer program director of the Brewers Association and one of the most influential advocates and thought leaders in the craft beer industry. Herz notes the growth of different types of pumpkin beer has led the Great American Beer Festival this year for the first time to expand to two pumpkin categories, one for pumpkin/squash beers and the other for pumpkin spice beers. Pumpkin/Squash Beer was added to emphasize perception of pumpkin and squash aromas and flavors, without spicing. To be sure, some breweries are jumping off the pumpkin beer bandwagon. Starr Hill Brewery in Crozet, Va. this fall took its Boxcarr Pumpkin Porter of the rails. “Boxcarr had been in rotation for several years and we were definitely interested in injecting something new and fresh into the fall lineup with that level of distribution for our portfolio,” said Jack Goodall, marketing manager at the central Virginia brewery. He acknowledges that biggest reason behind the change is what he calls “pumpkin fatigue” in the market. On the plus side, Starr Hill had a newer fall seasonal to promote, a sweet tasting Maple Brown Ale. “It's really nice to be able to offer an alternative to the typical Pumpkin/Oktoberfest beers that come out this season, so we were excited to have something a bit more unique,” he said. In truth, though, most brewers are sticking with pumpkin style beers, offering different concoctions and exploring new ways to market them for an increasingly finicky audience. Shipyard Brewing: one of the nation’s largest craft brewers, had its signature Pumpkinhead ale coming off the bottling lines when I visit the Portland, Maine plan in July. The 4.5% abv crisp wheat ale was first brewed in 1996. Since 2009, Shipyard has also offered Smashed Pumpkin, a 9% abv. ale that has a lot of character, spice and big malty mouth feel. For an even bigger kick, since 2014 Shipyard also bottles an 11.1% abv. Bourbon Barrel Aged Smashed Pumpkin. Flying Dog of Frederick, Md. this year teamed up with Salazon Chocolate Co. to make a chocolate bar made with it’s the Gourd Standard Pumpkin IPA. Known for its line of organic salted dark chocolate bars, Salazon incorporated actual ingredients from the beer into the chocolate, including German Nobel hops, our custom pumpkin spice blend and sea salt infused with the beer itself. “We view craft beer as an art form and jump on the opportunity to work with likeminded artisans,” said Ben Savage, Flying Dog’s chief marketing officer. The Gourd Standard is a rare IPA pumpkin beer, so it has a more complex character with slightly hoppy banana bread feel mixed with caramel sweetness. No wonder it goes great with chocolate. Steven Point Brewery: a bronze medal winner in the 2016 New York International Beer Competition, this fall has released its Whole Hog Bourbon Barrel Aged Pumpkin Ale into bottles for first time. Its available across Wisconsin where its made and is said to taste more like pumpkin pie than most pumpkin ales. New Belgium Brewing in Fort Collins, Co. has brought back its Pumpkick Spiced Seasonal Ale which offers a tartness not found in most pumpkin brews. Pumpkick pours a slightly hazy, glowing orange, packed with pumpkin juice, cinnamon, nutmeg, allspice, and a snappy dose of cranberry. .
Devils Backbone of Roseland, Va. has its Pumpkin Hunter, a 5.1% abv balanced pumpkin ale. Brewmaster Jason Oliver designed the flavors to layer like liquid pumpkin pie. The malts impart a graham cracker pie crust character around a rich, subtly sweet pumpkin and spice body. Even in South Florida, where fall temperatures hover around 85 most days, pumpkin beers are still the rage. Pompano Beach, FL,-based Bangin Banjo has its Johnny B. Gourd, a sweet pumpkin ale spiced with toasted coconut, cinnamon, nutmeg and ginger. Also in Pompano Beach, 26 Degree Brewing has decided to lampoon pumpkin-beer season with Not Another F'n Pumpkin Porter. Its brewed with canned raw pumpkin, nutmeg and ginger and other spices, and in the tap room is served in a snifter rimmed with cinnamon sugar. Some brewers stress making pumpkin beer is about honoring its history in American beer making. Sam Adams, a 2016 gold winner in the NYIBC which this year has introduced nationally its 20 Pounds of Pumpkin ale—also recalls the history. The Boston-based brewery says Pumpkin ales is one of the oldest American beer styles, though it wasn’t overly popular centuries ago. 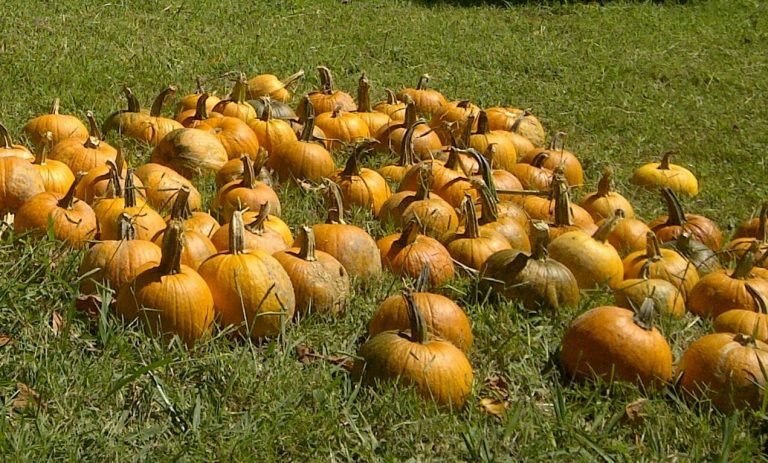 Still, early colonists often lacked some classic beer ingredients, so in place of malt they used other fermentable sugars like sweet potato, squash, and, of course, pumpkin. These days, pumpkin beer is no longer made for lack of any raw ingredients. Rather, even with so many choices of brews on the market, beer drinkers still like the taste of a little pumpkin in the glass to remind them that cooler temperatures, Halloween and Thanksgiving is just around the corner.